EBADAN-IR (March 19th, 5th race, SA) – Made his U.S. debut as a first-time gelding and a first-time Lasix user off an four-month layoff and turned some heads with an impressive deep-closing score in a first-level allowance Hillside turf sprint while facing older horses. The Neil Drysdale-trained sophomore had only one horse behind him crossing the main track but displayed a turn of foot that only good horses have and was up in the final jump to register the upset score. Broke his maiden at a mile over the all-weather surface at Dundalk in Ireland before being imported so added distance certainly won’t be an issue. No doubt will be seen next against his own age group in stakes competition and could easily be up to the task. RUTILE (May 21st, 8th race, SA) – Half-sister to Kentucky Derby winner Giacomo broke her maiden at first asking sprinting a year ago March at Santa Anita but then disappeared. She returned in this competitive first-level allowance dash and did very well to wind up third after being last of 12 and more than 10 lengths behind with a quarter of a mile to go. Clearly rusty and in need of the outing, the daughter of Medaglia d’Oro should benefit immensely from this effort and figures to be fitter and tighter next time, especially with a bit more ground to work with. Despite being five years old she’s still a bit green (failed to change leads) but it’s not too late for her to develop into a good sort, assuming she can stay sound for trainer John Shirreffs. SENSITIVELY (May 19th, 7th race, SA) – Took her third straight win while moving up the class ladder and simply has run out of competition in the allowance ranks following another laugher, this one over three-other-than competition by almost six lengths in 1:08 flat while earning yet another stakes-quality speed figure. The Phil D’Amato-trained daughter of Street Sense quickly made the pace in hand and was never challenged while winning with plenty left. Very curious to see how she’ll fare when matched against the best older sprinting fillies and mares in the West, but we’re thinking she’s going to do just fine. UNBROKEN CODE (May 21st, 1st race, GG) – The first foal from the good Turf Paradise sprinting mare Complete Rule, this daughter of Wilburn made quite an impression in her debut and seems certain to be heard from in juvenile filly sprint stakes this summer on the fair circuit. Forced the pace from the start of this four and one-half furlong dash, continued gamely when challenged from both sides in the drive and prevailed in game style in a quick 52 1/5 seconds for the distance. The Ed Moger-trained speedster has the moxie of a quality sort and should prove more than useful for her connections. 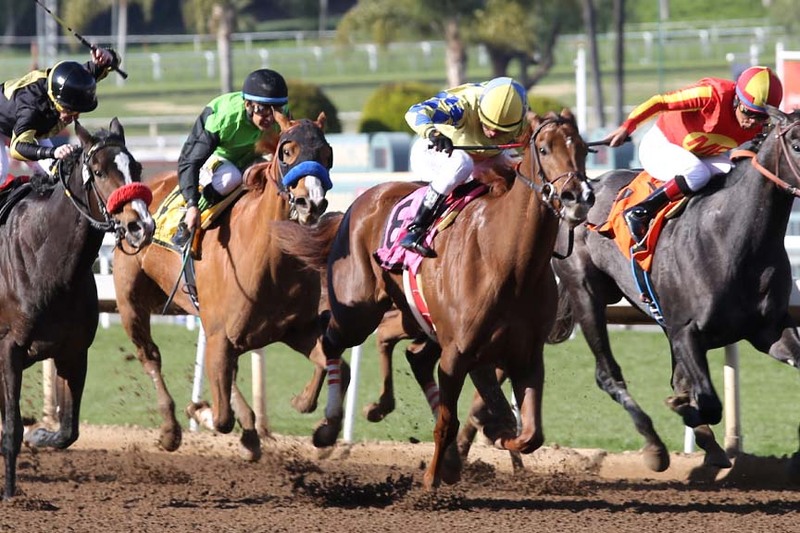 VICTORY CALL (May 22nd, 6th race, SA) – Had a bit of an educational run in an all-weather maiden event at Kempton last November and showed up in a maiden special weight dash in his U.S. debut at Santa Anita five months later for trainer Simon Callaghan. Hadn’t done a whole lot in the morning and received no wagering action (5-1 up to 18-1) but turned in a noteworthy performance, stalking the pace for a half, taking control into the lane and then bravely holding off Viz Clortho to graduate with a powerful 88 Beyer speed figure. Failed to change leads in the lane so he still has plenty work on, but this $200,000 yearling by Speightstown has the makings of a very nice 3-year-olds and acts like he’ll handle at least a mile, if not farther. Curious to see where this colt will surface next.